A great alternative to Gnome Panel's Run Dialog and Unity's Dash is Synapse. 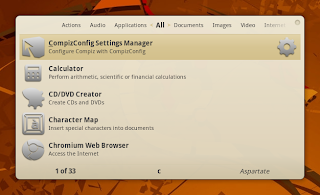 It can not only run commands, but also installed applications, which you would otherwise have to run through the menu of classic Gnome, Cairo Menu of AWN, or the Dash of Unity. And similar to the latter makes it use of the Zeitgeist engine to also give you quick access to any kind of recently accessed stuff. If you are running an earlier version of Ubuntu, you will have to use the PPA of Synapse anyway, because it was only added to the official repos with the release of Natty Narwhal. These PPAs provide the necessary packages for all Ubuntu releases down to Lucid. To get more matches for your queries in Synapse, you can install some additional data providers. You may spare the providers for apps you don't use. After the installation, you will find Synapse in "Applications > Accessories" if you are using classic Gnome or Cairo Menu of AWN, or in the Dash of Unity. For obvious reasons, set in its preferences that it gets run at login. When it's already running, you can summon it by just pressing Ctrl+Space. You can set another key combination in its preferences if you like. If you are using AWN, you can also run/summon it through the "Launch..." menu item in Cairo Menu.